Ferrari chairman Sergio Marchionne is "frightened he is going to upset his team" should he decide to supply Red Bull with engines, according to Formula 1 supremo Bernie Ecclestone. Ferrari has emerged as Red Bull's only option to continue in Formula 1 next year as the Milton Keynes-based organisation is to split with current supplier Renault at the end of this season, while Mercedes has decided against a deal. Ecclestone has confirmed initially brokering an agreement between Ferrari and Red Bull, although Marchionne has expressed the same concerns about doing so as did his counterpart at Daimler, Dieter Zetsche. The fear is with a clearly improving Ferrari power unit in an aerodynamically well-designed Red Bull, the customer would potentially be stronger than the works team. "For Formula 1, he [Marchionne] would love to do it, to get Red Bull competitive with an engine, but he doesn't want to damage the team he runs," Ecclestone told AUTOSPORT. "If Red Bull get [a better] engine then they are obviously going to be competitive, it's an obvious concern, but he's frightened he's going to upset his team. "It's now down to Sergio to make up his mind, and I'm sure it will be sorted out shortly one way or the other." Red Bull owner Dietrich Mateschitz - who is prepared to pull his two teams out of F1 if they cannot get competitive engines - revealed at the weekend talks with Ferrari have so far been "positive and encouraging". Ecclestone says Marchionne is aware of the pressure on his shoulders as to lose two teams and four cars from the grid would damage Formula 1. He also feels Marchionne's concerns would have been further raised by what unfolded during the Singapore Grand Prix on Sunday in which second-placed Daniel Ricciardo pushed race winner Sebastian Vettel to the chequered flag. 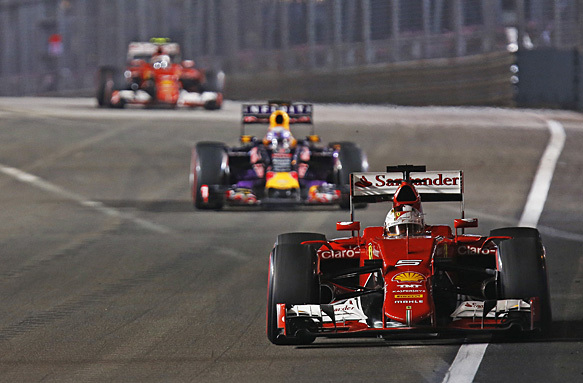 "It didn't help too much with the performance of Red Bull in Singapore," said Ecclestone. "Ferrari will say 'Well, what about if they had our engine?' because Red Bull challenged with an engine that is well down on power. "So Ferrari are concerned about Red Bull having the same power as them. "Frankly, I don't think it should be a concern because that race [Singapore] is a drivers' race, and if they had another 40 horsepower it wouldn't make a difference." I'd be scared sh*tless if my initials were Maurizio Arrivobene, but it would certainly put the pressure on Scuderio Ferrari to up their game and build a better chassis.